Why are dining rooms so difficult to decorate? Everyone in the design business knows this: dining rooms are notoriously difficult to decorate. Here are some thoughts, and some suggestions for avoiding some common pitfalls. Dining rooms have very little in the way of upholstery to soften all the wood in the room. I find that draperies are a must in a dining area, both for acoustical reasons as well as to visually soften the hard surfaces of sideboard and table. No other room in the house has so many horizontally-planed wooden surfaces, think about it. Even a wood-paneled study has vertically-planed wood, which for some reason, seems much different than the horizontal planes of the dining room wood. elements of the windows. The chandelier is so airy it almost goes away. Contemporary Dining Room design by New York Interior Designer Kwinter & Co. Perfectly scaled chandelier as a focal point, and also notice the repetition of the curves in the wallpaper scene. Masterful. I usually prefer one, the two below keep the room from having its proper focal point, and are too delicate for the space. Have you noticed many more rooms in magazines and blogs are showing two full-sized chandeliers? (This is just a trend, so it is going to look dated in a few years). What about a different pair at the host and hostess place to break up a matched set? And here, for a very modern treatment, P.S. Dear Owner, please drop the painting 30-36″ and it will be visually correct. It is hung entirely too high. 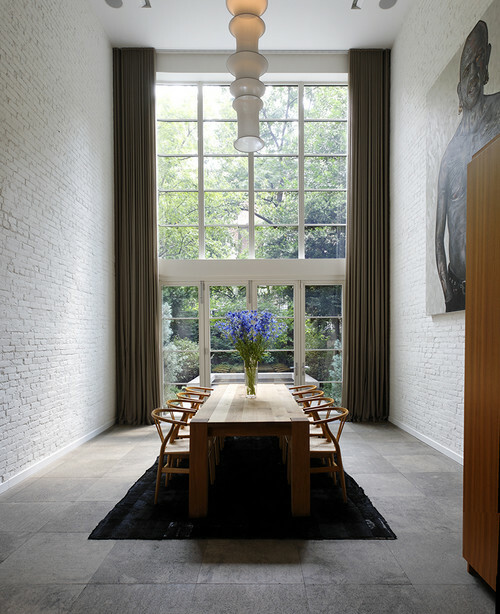 Contemporary Dining Room design by New York Architect d’apostrophe design, inc.
Make sure that your rug fits the space. with a good eye can help you decide the proper size for your space. Beware of banquette seating. It is one trend that looks great in photographs, but can be extremely impractical. This entry was posted on July 30, 2012 by Ellen at Color Calling. It was filed under Decorating trends, Residential styling and was tagged with dining room, dining rooms. Loved my mother-in-law’s dining room. It only came alive at nite with candlelite. 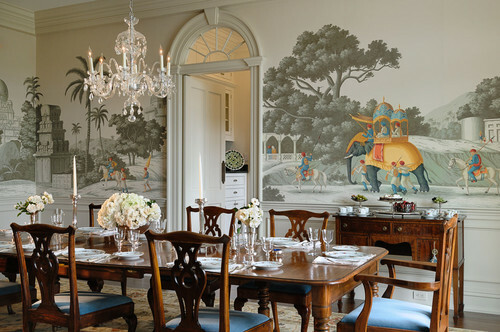 Ivory wall paper was plain in daylight, candlelite showed the chinoiserie pattern. Loved her double pedastal Baker table. Queen Anne chairs. New ones ordered & matched to the existing each time there was a marriage. All gone now. She’s been dead ages, 57 breast cancer.